On Thursday, all across this land, there is one question that will be asked countless times. "Is it time for pie yet?" At our house on Thanksgiving Day, that answer is "Of course!". It doesn't matter what the clock says, it's always time for pie! Pie-Baking is one of my favorite things and each year I try to make something just a little bit different, along with the traditional pumpkin pie's and such. This year, the latest offering came from the pages of the November Better Homes and Garden's Magazine. I gave it a test run a couple of weeks ago and it passed with flying colors, so another scrumptious pie has been produced for tomorrow's eating pleasure. 1. Prepare your favorite pie crust. 2. For Cranberry Compote: In a small saucepan combine cranberries, sugar, orange juice, orange peel and a pinch of salt. Cook over medium heat until the cranberries begin to burst and mixture starts to thicken, stirring occasionally. Carefully stir in cherries. Remove from heat. Cool. 3. For Caramel Apple Filling: In a large bowl gently toss together apples, lemon juice and peel. In a small bowl stir together brown sugar, flour, cinnamon, and 1/2 tsp salt. Sprinkle over apples, stir to coat. 4. In a large pot, melt butter over medium heat. Add apple mixture. Cook about 5 minutes, stirring frequently. Add whipping cream and vanilla. Continue cooking, stirring often, until juices thicken and apples are tender, about 5 more minutes. Remove from heat. Cool. 5. Preheat oven to 375 degree's. Roll out your pie crust and transfer bottom crust to a 9 inch pie pan. Line dough with parchment, fill with dried beans or pie weights and bake for 20 minutes. Reduce oven heat to 350. 6. Roll out the rest of the pie crust and with a cookie cutter, make fun shapes for the top of your pie. I did one in a maple leaf pattern and another using a turkey shaped cookie cutter. 7. Using a slotted spoon, spoon 1/3 of the cranberry mixture into the bottom of the pre-baked pie shell. Layer 1/2 the apple mixture on top of the cranberries. Spoon another 1/3 of the cranberries on this layer. Layer the rest of the apples. Spoon the remaining cranberries on top in random dollops. 8. Whisk together the egg and 2 Tbsp. water; gently brush on edge of crust. Place your pie-dough cut-outs on the edge of the pie and all around the middle as you see fit. Brush with egg wash and sprinkle with the coarse sugar. 9. Place a foil lined baking sheet on the rack below pie to catch dripping - (and this pie will drip!) Bake for 40 minutes. Cover edges with foil and bake another 10 to 15 minutes until crust is deep golden brown and filling is bubbly. Cool before serving with homemade whipped cream. I know it's not even Thanksgiving quite yet, but us crafters need to think about our Christmas gifts long before December 1st (and long before now!) When I was contemplating this year's Christmas gifts, monkeys came to mind. 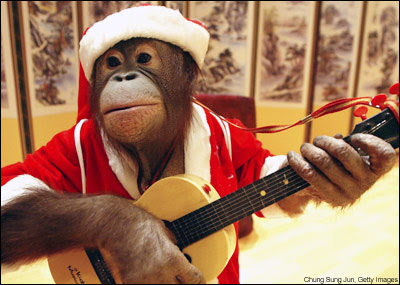 No one's sung about Christmas monkey. It's been that way for much too long"
So anyway, I was thinking about Christmas and reindeer and snowmen and santa and....monkeys...'cause who doesn't like monkey's? HOWEVER, as my daughter Brittany and I were strolling through Michael's a couple of weeks ago, in the $1.50 bin, (what the heck happened to the $1 bin?? ), we found the best striped socks. 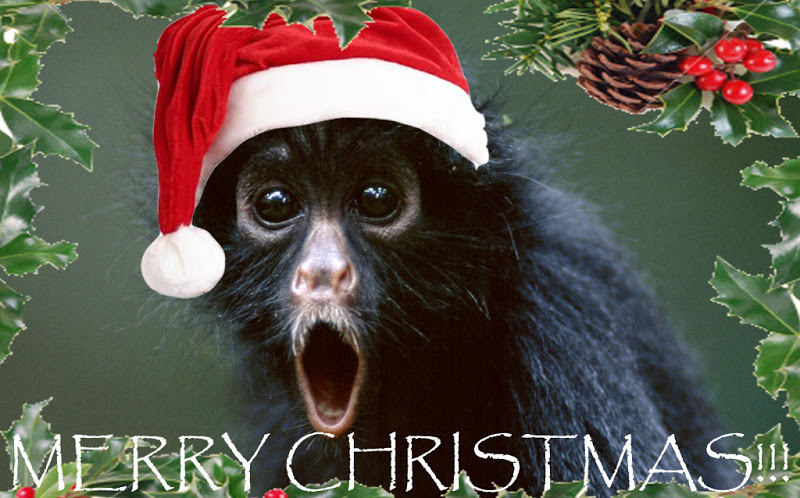 I snatched them up, ran home, locked myself in my crap, I mean craft, room and turned that pair of socks into a Candy Cane Christmas Monkey! 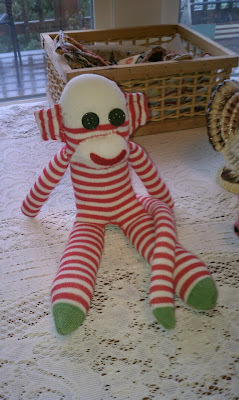 This little guy chatters ALOT and he's making my work space a very cheerful place this holiday season. Glad he came to visit, but I knew he wouldn't be staying long so back to Michael's we went and some more of those striped socks are now in my possession. Hehhehheeee. 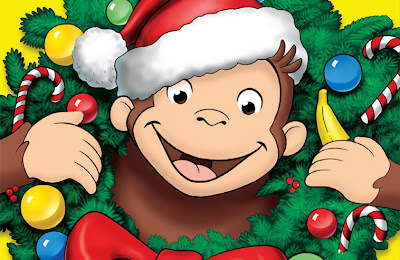 Christmas Joy! Time for Turn the Page...Tuesday hosted by Adrienne over at Some of a Kind! The first one was on old paperback gothic, which is always kind of fun this time of year. 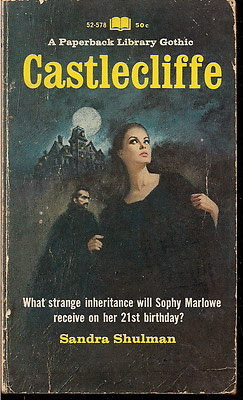 Castlecliffe by Sandra Shulman was written in 1967. I found it at one of our thrift stores awhile back. Sophy Marlowe is a young woman who has just lost her father. His final letter to her asks her to go to Castlecliffe to stay with his dear friend, Sir Pelham Eastlake, until the time of her majority (21st birthday) when she would receive her inheritance. Not long before she reaches Castlecliffe, the coach that Sophy is riding in is stopped by a rogue highwayman known as Jack Midnight. The only thing this thief takes is Sophy's letter from her father to her guardian. When the other coach riders find that Sophy is to live at the feared Castlecliffe, their friendliness towards her instantly changes. It seems the residents of this castle are feared, as is the castle itself and the marsh surrounding it. What fate is Sophy riding into? 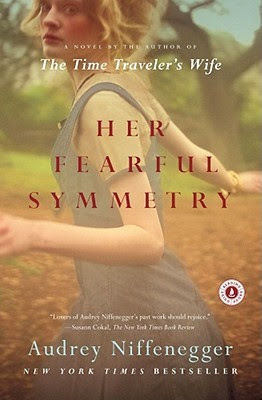 Her Fearful Symmetry was quite an interesting read full of some even more interesting characters. Haunting and creepy, this is the story of two different sets of twins who are incredibly close, to the point of not being individuals. First there was Elspeth and Edie, twins who broke their relationship years ago with a secret that tore them apart. Now Elspeth has passed away and has left her flat in England to her two American nieces, Julia and Valentina. The catch is that the girls, twins themselves, have to live in the flat together for one full year before they can sell it and their parents are not allowed to enter it. Once the girls arrive, they find that their new home overlooks the historic Highgate Cemetery where not only are many famous Londonites buried, but so are the girls ancestors, including Aunt Elspeth. Having never met their aunt, the girls can sense her presence in the flat and are curious about her. They try to find answers from their eccentric neighbors - Martin writes crossword puzzles for the local paper and his wife has recently left him due to his severe OCD which leaves him stranded in his apartment. Robert lives downstairs and was Elspeth's lover as well as the executor of her will and a guide in Highgate Cemetery. He see's the girls as they arrive and is shocked at how much they resemble Elspeth. He struggles with nerves at approaching them and it's weeks before he finally introduces himself. Valentina has some health problems, would like to college and have parts of her life that she does not have to share with her twin sister. She is the one who can feel Elspeth in the flat. Julia has no health problems, does not care to go to college, is the more dominant and bossy twin who will not allow anything that may lead to the twins possibly leading separate lives. Fantastic! Historical fiction is my favorite genre and there is nothing like a good witch book this time of year. Author Katherine Howe did an incredible job of mixing historical fact in this fictional story. Connie Goodwin is a graduate student working on her Ph.D. in colonial history when she receives a message from her mother, Grace, that she needs to go to her late Granna's house in Marblehead. The house has been empty for many years and is about to be sold for back taxes. Grace wants Connie to clean it up and get it ready to sell. Once there, Connie finds an antique Bible of her grandmothers and inside the Bible is a key with a tiny piece of parchment paper tucked inside with the name Deliverance Dane written on it. 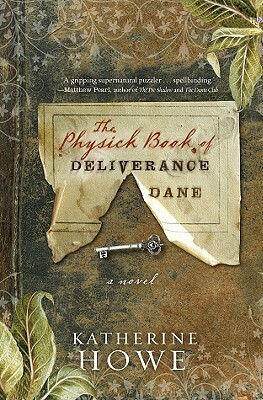 While researching the name, Connie finds that in 1692, Deliverance Dane was ex-communicated from the church. 1692 was the year of the Salem Witch frenzy. Had Connie stumbled on to an unknown Salem Witch? The thought is intriguing and when she mentions it to her adviser, Professor Manning Chilton, he encourages her to hurry her research along and write her dissertation on Deliverance. 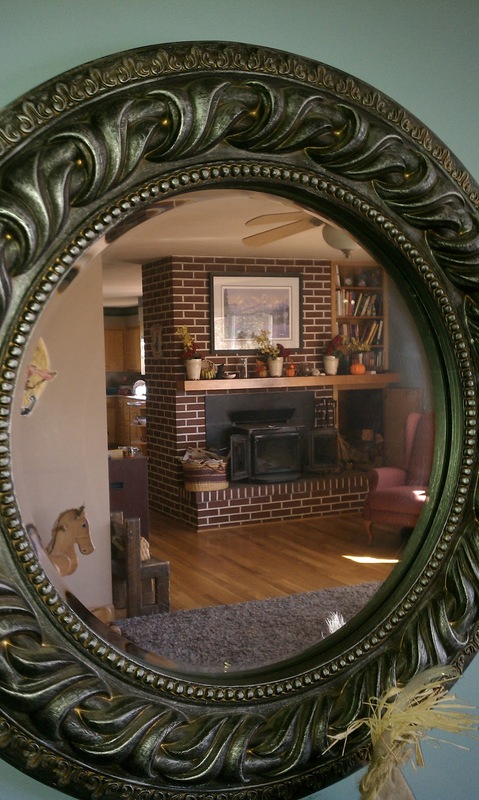 As Connie digs deeper into her Grandmother's home and into the mystery of Deliverance Dane, strange things begin to happen, making her question history and her own beliefs. What if there was some truth to the witchcraft these women were accused of? Incredible novel. I am so looking forward to reading more from Katherine Howe. So that's it- my October reading list. Pop over to Some of a Kind to tell us what you have been reading and to see where others reading has taken them this month!